Going back in the 80’s when the romance came back to the big screen, I have put forth the 5 movies which have changed the face of Bollywood. These are the all-time classics which will be evergreen and have all the elements of comedy, tragedy, romance and fun in it. Our bollywood is known for its masala and romance, here are the movies which started this whole trend in the industry! 1. Qayamat Se Qayamat Tak (QSQT): This movie turned the direction of bollywood films from typical hero-villain violence to Aamir Khan and Juhi Chawla captured the imagination of the younger generation when they played young lovers who eloped due to family disapproval. Their perfect cute chemistry brought about a freshness which was commendable. This love story shot both Aamir and Juhi to fame! This story of undying love got many hearts throbbing. :Papa Kehte Hain Bada Naam Karega” is one song which all generations know of!! QSQT is known to be India’s romeo-juliet love story. It received several awards including Filmfare. It totally deserved it….PERFECTO!! 2. Maine Pyaar Kiya: One of those epic movies when Salman Khan was young and fresh who romanced the new actress Bhagyashree. Rajashri productions known for their classic love stories surely set a benchmark for open romance – wohoo! This was one of the first romantic movies which was modern and bold, where the hero romanced without any hesitation and certainly looked very good doing it. The movie emerged to be a great hit among all generations and thus started the journey in making of never-ending romantic movies in Bollywood, but one wonders if it would be as successful without the kabootar! 3. Dil Wale Dulhaniya Le Jayenge DDLJ): Aah, this is everyone’s favorite, I still watch the movie every time it comes on television. Shah Rukh Khan and Kajol’s ultimate romance got the “king of romance” right from the Luxury of Europe to the small village in Punjab where the “sarso ke khet” became the highlight of the movie. This scenic movie caught everyone’s attention with its wonderful and different story. The fights, the running through the fields, the guitar, the dialogues, all of it became epic. It was released in 1995 and is still successfully running in Mumbai’s Maratha Mandir and of course Amrish Puri got the movie rollin’ baby. 4. 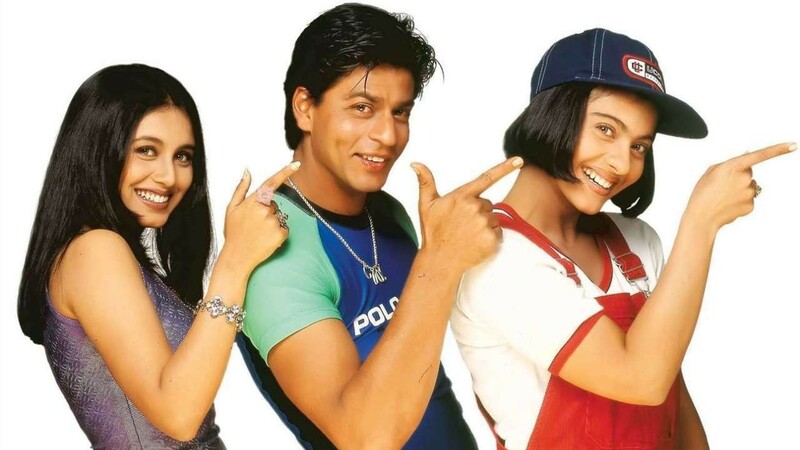 Kuch Kuch Hota Hai: This movie got me thinking about all the college romances I ever had 😛 Two best friends, caught in the love triangle, but finally find their way back to each other. This was a super hit as everyone connected to the move. The young energy and the hyper vibe got everyone to be enthusiastic. ShahRukh Khan, Rani Mukherjee and Kajol played the perfect trio in this movie. Overall, the movie was so colorful that one can never take their eyes off it. The playfulness and the presence of Farida Jalal and the little Sana made the movie a complete package. Not to forget Kajol’s tom-boy getup! loved it! 5. Hum Aapke Hai Kaun: This movie started the whole trend of getting the big-fat-Indian wedding on screen with all the customs. Once this movie started this, no one stopped. We still have movies based on “shaadis.” The two leading actors of their time – Salman Khan and Madhuri Dixit set the screen on fire with their chemistry and the amazing songs and dances. If it had not been for Madhuri’s dance and her outfits, Salman’s playfulness, the sizzling chemistry and of course our little Tuffy (the dog), I wonder how good would have the movie been? Nevertheless, we all will agree that Hum Aapke Hai Kaun was an amazing love story and it definitely did leave a mark behind.